Newcastle United and manager Rafa Benitez are currently enduring a difficult start to the 2018-19 season, earning just two points from their first six Premier League fixtures. The opponents early on have certainly been tough, but the Magpies’ attack once again has been a major cause for concern. The Toon have scored four league goals, with two of them coming from defenders (DeAndre Yedlin and Ciaran Clark). 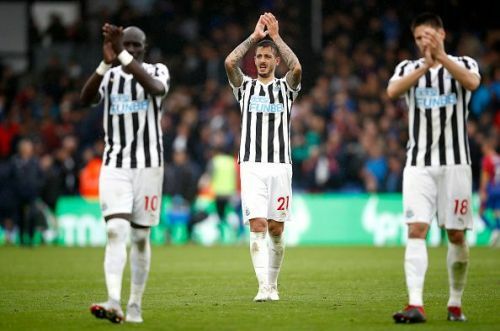 The other two were courtesy of Joselu, but the striker has dealt with consistency issues in the final third since signing with Newcastle last term. Benitez’s 4-4-1-1 formation is conservative, and that makes sense against clubs with immense quality such as Manchester City and Chelsea. However, playing the likes of Crystal Palace should have seen United “go for it” a bit more in the attack, and that is where a 4-3-3 shape could get the best out of the players. Goalkeeper Martin Dúbravka has been superb, and the back-line has been steady as well. With the midfield re-aligned, Benitez can allow more freedom for Jonjo Shelvey. His vision and long passes can create space and opportunities for team-mates in the opposing half, a vital component for Newcastle if they are to net more goals. The incredible stamina and tackling of Mohamed Diame can help to cover ground in the middle, along with the efforts of Ki Sung-yueng. Ayoze Pérez has not had a positive impact during the past few matches, and modifying the front-line could have some significant benefits. Kenedy’s skill on the ball could shine brighter if positioned further up the pitch, and that may help the Brazilian to improve his own form as well. Salomón Rondón and Joselu can still operate as centre-forwards, using their size and aerial abilities to hold up possession. Flanked by two other attackers, the strikers would likely find more space in front of goal for themselves also. On the right side, Matt Ritchie’s crosses into the penalty area can be an effective weapon, while Christian Atsu’s pace would cause issues for defenders. This formation can provide more for Benitez’s side, as they look to rise from the league’s relegation places early in the season. Unfortunately, it may not all be so simple. Benitez was able to finish in the top half of the table in 2017-18 with his current tactics and almost the identical group of players. The Spanish coach knows what it will take to survive in the English top flight, and it is never easy to change a philosophy mid-way through a campaign. Those struggles were clearly seen when the Magpies experimented with a three-man defence earlier this year. Newcastle United and Rafa Benitez are currently without a win in 2018-19, preparing to face Leicester City on Saturday afternoon at St. James’ Park. The club need to score goals, and a 4-3-3 formation may be what leads them to that particular outcome.